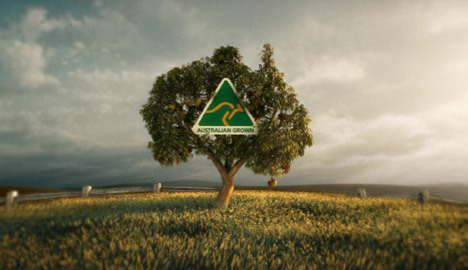 Australian Made Campaign Limited has launched a new logo, “Australian Grown”, using an animated television advertising campaign. Australian Grown aims to extend public support from ‘Australian Made’ to authentically home grown produce and chose the theme of a growing tree to symbolize the development of home-grown produce economy. The Australian Grown advertising campaign was developed at Cummins & Partners by creative director James Procter, creatives Tian Murphy and Tom Jackson, and agency producer Georgina Toole. Filming/animation was directed by Tim Kentley at XYZ Studios with producer Amy Veerman with 3D Lead Clinton Downs, Lighting Thai Bach, Modeller Cedric Austria, animators Tim Kentley, Cedric Austria, Clinton Downs, Chris Burness, Chris Burns, Compositor Daniel Stonehouse. The XYZ team, lead by design director Tim Kentley, placed the Australian Grown logo into a dynamic ‘Australian’ environment: featuring soaring camera moves through a native eucalyptus tree densely laden with produce, the Australian Grown spot hums with life. Growing from the simple idea of following a seed from germination through to maturity the concept literally sprouted and grew branches. The first challenge was creating an animated tree that was both natural and controllable. On top of this the tree needed to grow realistically. The solution called for propriety scripting, and a lot of technical work and lateral thinking from the 3D team who were choreographing over 19,000 animated leaves. 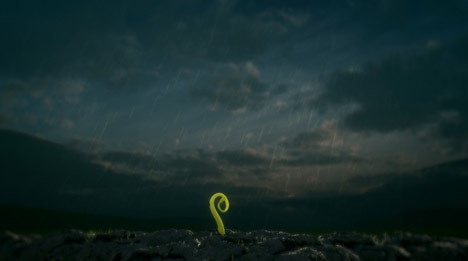 The spot’s seamless, single shot nature was another challenge to overcome, requiring careful, precise synchronisation of animation and camera movement, along with intricate animated lighting. Backgrounds with dynamic, hyper real clouds and sky were developed in tandem with the trees evolution. 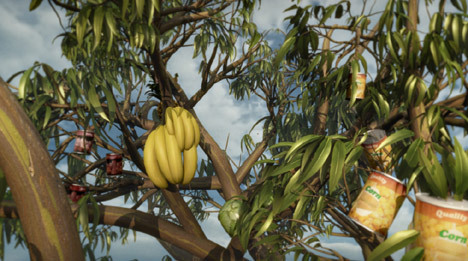 The tree was laden with a cornucopia of fresh fruit and vegetables, dairy cows and trout, meticulously placed and animated so as to create pleasing compositions. Care was taken in compositing to give the spot a distinctly authentic Australian feel. “We tried to capture a feeling of moving from dawn to dusk over the course of the spot, and to give the grade a sense of that particularly Australian light,” said compositor Daniel Stonehouse. The end result, with computer generated imagery also output for a press campaign, is an dynamic, exciting, ride through a world that emotively answers the question of what it means to be Australian Grown. Music was composed by Mark Landon. Sound was designed at Gusto.